At Trost Marketing, we are your marketing and printing resource made up of inspired and ambitious marketing professionals. 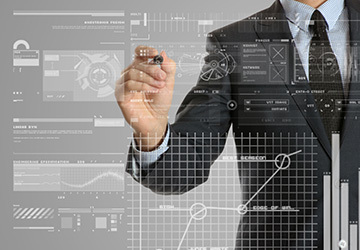 We are dedicated to helping our partners grow by providing effective and affordable solutions that drive results. We are a collection of inspired and ambitious marketing specialists that have the tools and knowledge to help your business grow. Using our on-site state-of-the-art printing facility, we deliver faster service and lower costs for your business. We understand that we don't win if you don't win, so building a long-term relationship of trust, and helping you succeed is our number one priority. How important are you? Our daily mission is to connect with you to help you achieve your dreams for your business. We are more concerned about a long-term relationship than the short-term sale. Marketing is your first connection with your customer. It is your investment in yourself and we take that very seriously. Solo direct mail card targeting your potential customers. These eye-catching pieces are custom made with your company's information and come in many different shapes and sizes. Use the power of direct mail to put your message in your customer's hands. Powerful marketing campaigns start with great demographics. Trost Marketing's DataGuide Demographic Method (DDM) is our demographic selection process that helps you fine-tune your marketing. There are many types of customers you can target, but your product is best served focusing on the most qualified potential customers. Without the DataGuide your campaign can lose its power. So focus your next campaign with Trost Marketing and increase your marketing power! 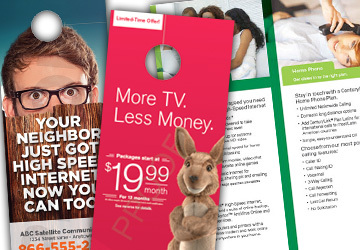 The Trost Radius Mailing Program helps businesses target a recent customer's neighbors. Potential customers can be anywhere in their neighborhood, so targeting them after a sale will lead to more potential business. Call a Trost Marketing representative to learn more about our automated radius mailing program. Want a low cost per sale? Trost Door Hangers are a great way to increase sales and help you maximize your marketing funds. 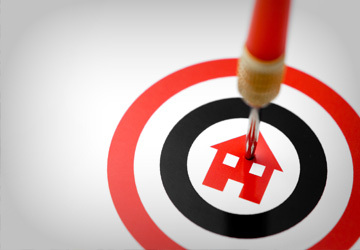 Target areas where you've done business in the past or expand your market. With low entry level pricing, order as many or as few as you need. Don't miss out on this low cost per sale option. Looking to advertise in your local newspaper? 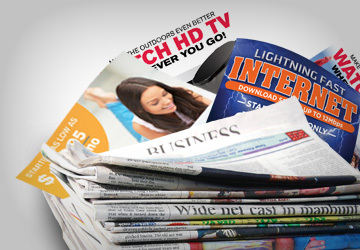 Trost Marketing will customize a newspaper insert and then negotiate the placement in your desired market. 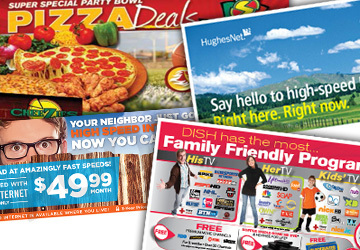 This is a turn-key program for printing and ad placement.  Because of our national buying power and marketing experience, we are typically able to acquire great rates for you in any newspaper across the country. Campaigns can be scheduled for single or multiple run dates. Make your mark and capture your audience's attention. 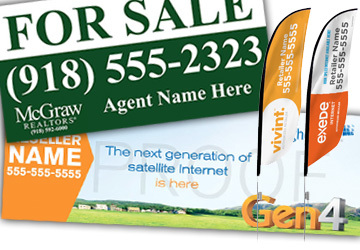 Banners and flags are a great way to bring attention to what you are selling. They are perfect for high traffic areas, or a great conversation starter in your showroom. These simple advertising elements advertise your message and are instantly noticed. With banners and flags, you can advertise virtually anywhere. Choose from our pre-created templates or go full custom, and the pricing is out of this world. 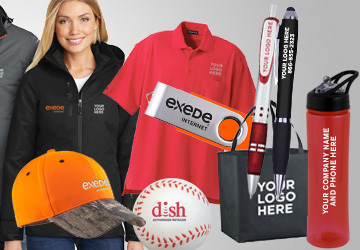 Looking for promotional products? You've come to the right site! Whether you are looking for a specific item or just browsing for ideas, our site is your one-stop source. We work with over 3,000 vendors to make sure we have what you need. Everything is perfectly orgainized just for you and we can customize any product with your branding. You will need a username and password to login to our file transfer service. If you need a current username/password, please request one using the contact form. Trost Marketing is looking for team members that want to succeed at work and at home. We believe that employees who are thriving and growing as people create a better work environment for everyone. When new opportunities for employment become available we'll post them here, so be sure to check back from time to time to see if there is an opportunity that fits your skills. We accept Visa, MasterCard, Discover, and American Express. All online orders are processed through 128 bit SSL encryption to protect your credit card information during your online transaction.Â All prices and figures are listed in US Dollars.